"A Baybayin Tradition worth Repeating." From a 1635 land deed. UST Archives. Earlier this year, we covered this in our papers and presentations at the International Workshop on Endangered Scripts of Island Southeast Asia held in the Tokyo University of Foreign Studies, Japan. Since I introduced the ᜍ "RA" glyph into my fonts a few years ago, it slowly gained acceptance and has become a de facto standard for the "RA" character. 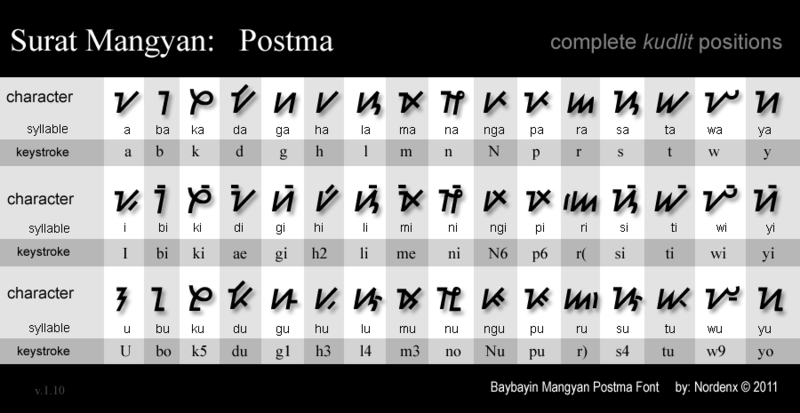 Similarly, I there has been an increase of online usage and enthusiasm for Antoon Postma's "pamudpod", from Surat Mangyan, a crescent-shaped virama (for indicating a trailing vowel-less consonant) since I also include the glyph in all my fonts. So, I think that it is about time that we bring back the dual-kudlit for syllable doubling convention. I am confident that the practice will gain acceptance once again, given some time, exposure, and proper education. There is one hitch though, we need a couple more new markers. Since the /a/ vowel sound inherent to each base baybayin character is obviously not marked, how do we repeat an /a/ ending syllable without doubling a base letter? ...or repeated compound syllables too for that matter? We have to look into other related South East Asian abugida scripts for answers. Luckily, we didn't have to look too far. I found that the Buginese (Lontara/Bugis) ᨞ “pallawa” mark is used to separate rhythmic-intonational groups and also used to denote the doubling of a word or its root. We can borrow the same concept and style/position as the the pallawa mark. We can actually use the pallawa mark to denote word or root doubling. It would greatly reduce reduplication of words like "halo-halo", "bola-bola", "turo-turo", "Bong-bong", "bato-bato", "sunod-sunod", etc. Borrowing from the pallawa concept, I introduced the : colon as a “padalaw-a” mark in my Tokyo paper. The padalaw-a mark also doubles the vowel characters in the same manner prescribed in the book "Ang Wika at ang Baybaying Tagalog" by Tolentino (1937) except that the marker is on the right side instead of being on top or bottom of the ᜁ I and ᜂ U characters. The padalaw-a mark makes it possible to repeat an /a/ ending syllable without doubling a base letter. Another extended possibility for this type of Kudlit mark is what I call a “pahantig” mark which is a single solid dot • mark on the right side of the a consonantal syllable character; it duplicates the consonant sound at the end of the marked syllable. Before we could disseminate this, I would have to update all my fonts to include the pallawa mark. Currently only a couple of my commercial license fonts has the updated markers. The pallawa is assigned to the \ backslash key. In the mean time, we can educate baybayin practitioners about this forgotten tradition and updated solution. 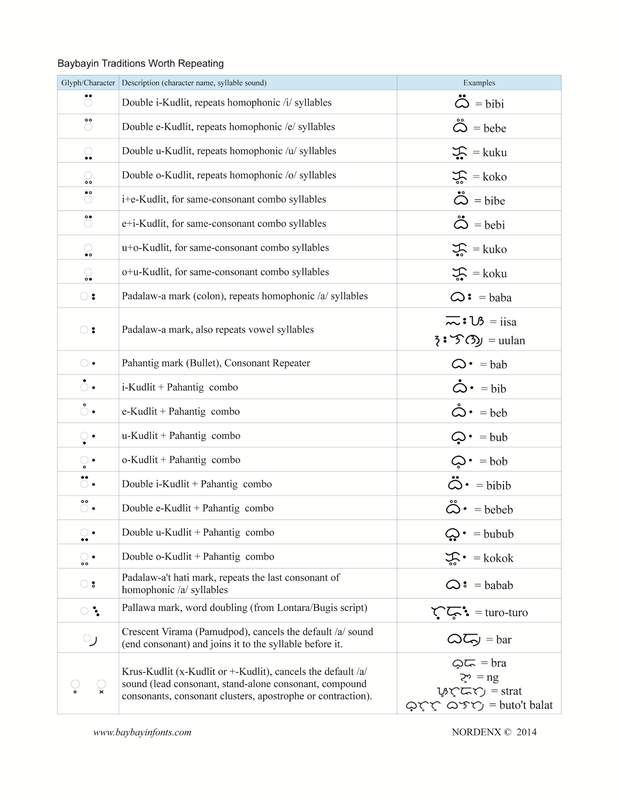 Baybayin dual / doubling / repeating marker system chart. Baliktárin Palindrome and Baligtádin Ambigram. A new exercise in tradition. Try your hand and mind at it; see what you can create. Baligtádin ( ᜊᜎᜒᜄ᜴ᜆᜇᜒᜈ᜴ ; lit. reversible ) is a Baybáyin equivalent of an ambigram. Basically, an ambigram is a typographic, calligraphic, or symbolic art form representation of a word or phrase, whose elements retain meaning when viewed or interpreted from a different direction, perspective, or orientation. The meaning of the ambigram may either change, or remain the same, when viewed or interpreted from different perspectives. Baligtadin ( ᜊᜎᜒᜄ᜴ᜆᜇᜒᜈ᜴ ; lit. reversible ). is a Baybayin equivalent of an ambigram. 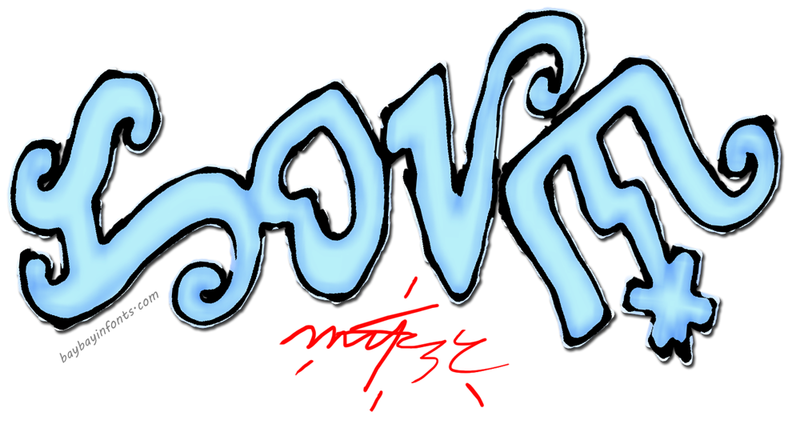 Faux-Latin Alphabet "Love", ᜃᜊᜌᜈ᜔ "Kabayan" (townsfolk/countrymen) a Multi-Lingual ambigram. Baliktárin ( ᜊᜎᜒᜃ᜴ᜆᜍᜒᜈ᜴ ; lit. returnable back and forth ) is a Baybáyin equivalent of a palindrome, or in other words: a palindromic Tagalog sentence written in Baybayin Script; it reads the same from the beginning to the end or from the end to the beginning. The unit of Baliktarin is mora (per syllable measure) since the Baybayin Script is an Abugida (alphasyllabary or phonetic-syllabary). This syllabic constrained writing differs from a Palindromya (Tagalog Palindrome), which is written using the Latin Alphabet and uses phoneme (per letter measure) as unit. 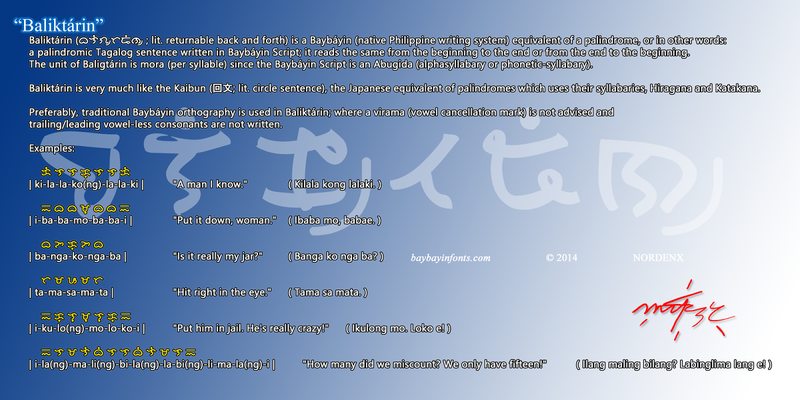 Baliktarin is very much like the Kaibun (回文; lit. circle sentence), the Japanese equivalent of palindromes which uses their syllabaries, Hiragana and Katakana. 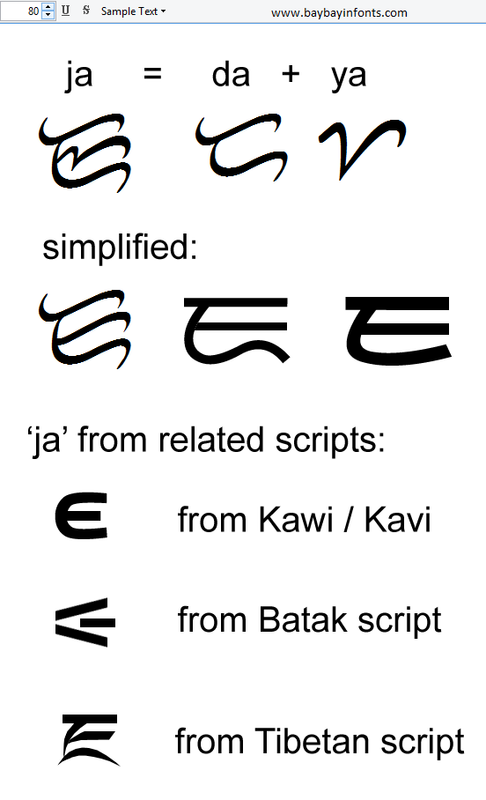 Preferably, traditional Baybayin orthography is used in Baliktarin; where a virama (vowel cancellation mark) is not advised and trailing/leading vowel-less consonants are not written. "Is it really my jar?" "Hit right in the eye." "Put him in jail. He's really crazy!" Ilang maling bilang? Labinglima lang e! "How many did we miscount? We only have fifteen!" Baliktarin ( ᜊᜎᜒᜄ᜴ᜆᜍᜒᜈ᜴ ; lit. returnable back and forth ) is a Baybáyin equivalent of a palindrome. Baliktárin (baybayin palindrome) - key word "BALIK" meaning "RETURN". Baligtádin (baybayin ambigram) - key word "BALIGTAD" meaning "REVERSED" and "UPSIDE DOWN". Baliktarin palindrome, once you read it forwards, RETURN and read it on the way back. Baligtadin ambigram), you can turn it around over and over and still read it while REVERSED and UPSIDE DOWN. "Festival of Philippine Arts and Culture" (FPAC) www.filamarts.org - is the largest presenter of Philippine arts and culture in Southern California presenting over 1200 artists in 9 disciplines and attracting audiences of over 25,000 people from all over the country. FPAC 2012 @ San Pedro, California. 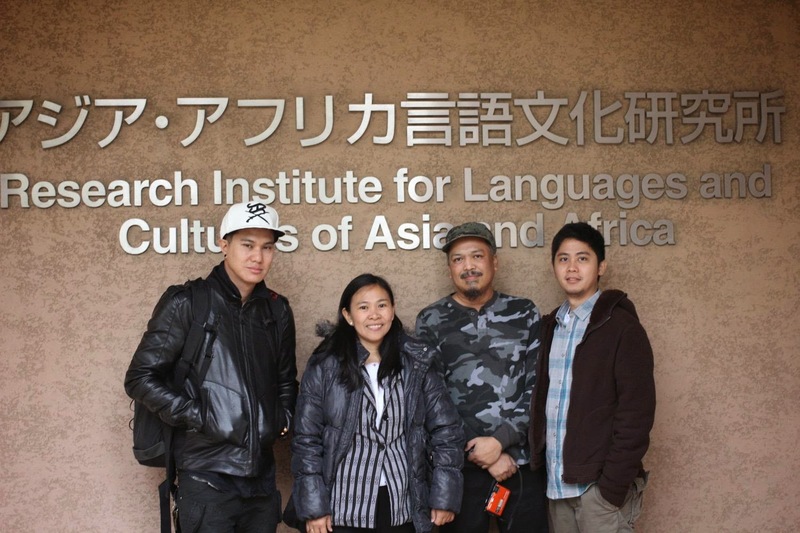 When FPAC's Pacific Artists Network (PAN) opened up an opportunity for Baybayin Script artist-activists like Kristian Kabuay (baybayin.com), Ray Haguisan (malayadesigns.net), and myself ("Nordenx" baybayinfonts.com), for us to reach and teach more people in Southern California about our advocacy to preserve & propagate our ancient script, we took it. Since then, we have been in attendance at FPAC every year. On a side note, I met Kris back in 2010 in San Francisco at a babaylan conference (babaylan.net) and Ray back in 2011 in San Francisco's Pistahan (pistahan.net) event. 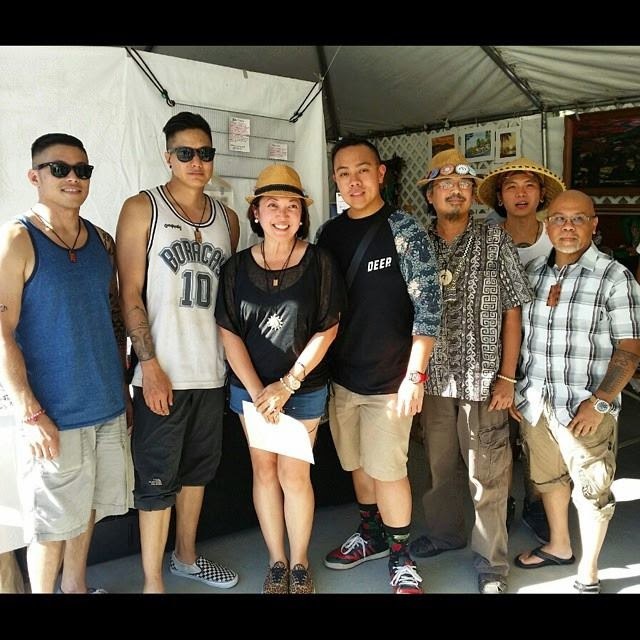 We've been together at various Filipino festival venues to promote our ancient script ever since. 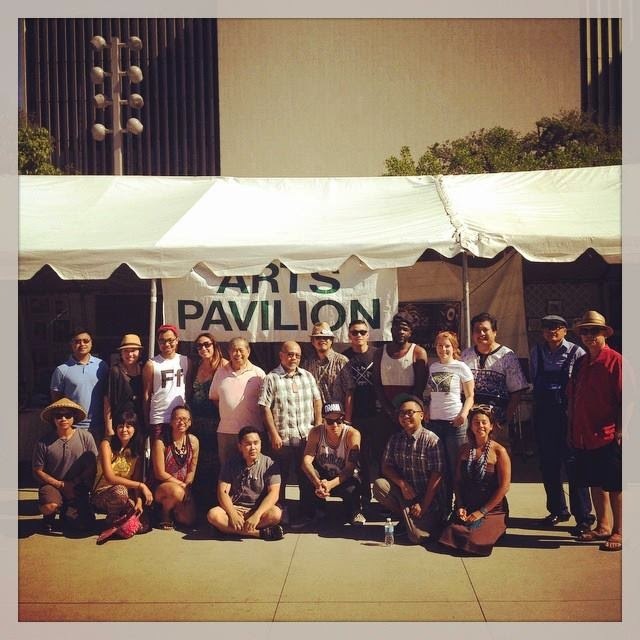 This year's FPAC weekend-long event at Grand Park, Los Angeles, had one of the most active Baybayin practitioners in attendance; particularly at the PAN pavilion tent. Despite the 100+ ℉ heat & humidity and the initial hassles of setting up, the rest of the weekend turned out to be very productive and positive. Foot traffic improved in the afternoons. We all had reasonable sales of our Baybayin themed art materials, but that is inconsequential to the amount of people who stopped by to listen & learn about our ancient script. I am delighted that many young L.A. Fil-Ams are becoming well-versed in our script. I am also pleased that they now know to avoid Alibata and the failures of Google search results. And I am proud that they also believe in the purity & sanctity of tradition; that "modern" doesn't have to be convoluted by the western alphabet's orthography; and that they recognize the difference between stylizing, functionality, and standardization. I lost count of how many people complimented my modern baybayin typography chart and the multitude of cellphone photos of it being taken. FPAC 2014 PAN Pavilion @ Los Angeles, CA. Kristian Kabuay's art & books are popular as usual, especially among the fan-girls. He did a live baybayin art on-stage and at the pavilion. Malaya Designs' pendants are hot as usual (he sold the most as usual). Hearing him explain the background story to his work always brings in a crowd. We were glad to finally meet and bring to our fold Robert J Sison and his fresh baybayin materials (love the temporary baybayin tattoos!). 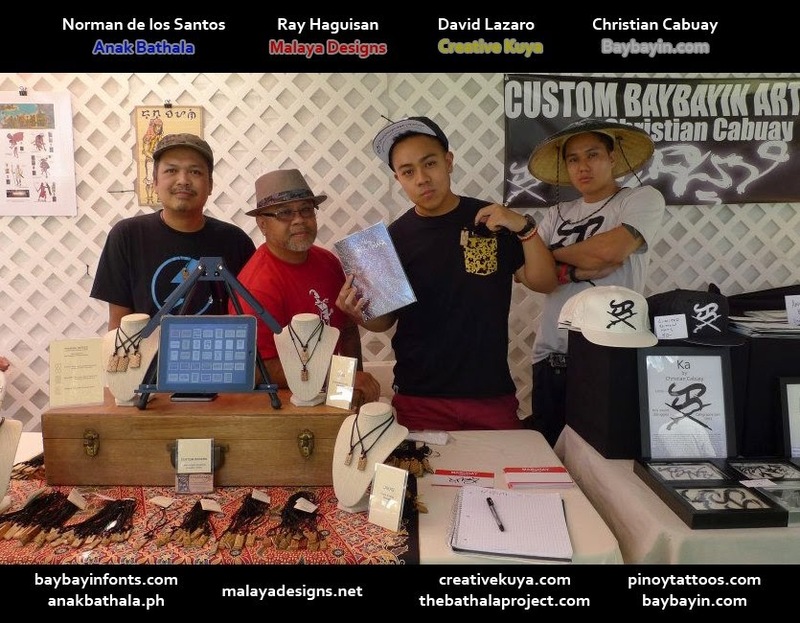 Inkanor's baybayin madala shirt & crafts are rockin'! Aicnelav Diyan's Bukobomba Solar Pyrography was a hit (many took photos and videos of her doing live solar pyrography). Glad to see Clarisse Pastor-Medina Art (coffee painting) and hear her talk to people about baybayin. Always a fan of Ka Faustino Caigoy, I can't believe he was just giving away his baybayin typography prints. But he's just such a nice guy. Eliseo Art A. Silva was in attendance, his murals speak for themselves, but he did a live art painting with baybayin too. Baybayin on youtube sensation, David Lazaro performed spoken-word poetry on-stage. Bayani Art, was selling their usual Historic Filipino Hero-themed shirts; a few with baybayin designs and Jacob Ira Azurin Vijandre's baybayin chart printed on them. Lauren Benetua's team set up a table for the People of Coloring project where kids of all ages sat down and colored-in the line arts that several of the baybayin artists listed above contributed. I saw a couple of message boards and signages from the Youth Groups with baybayin written on them. Correct & proper baybayin too. All in all, this was a successful venue in my humble opinion. We can't get to every visitor but collectively we reached hundreds of people and got confirmation that they are learning from what we teach; also confirming what we do matters to many. 3 fonts updated w/ RA and minor clean up. Last year the Mangyan people's leaders opted to reintroduce the older Hanunuo RA letter-form based on the LA character (with a minor modification on the rightmost up & down end strokes). They retired Antoon Postma's dash — RA that was based on the Buhid variant of Surat Mangyan. 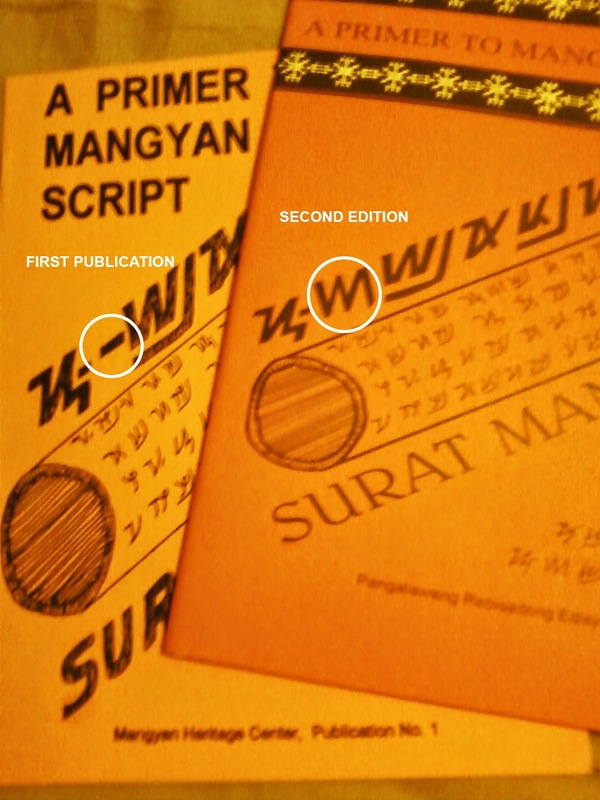 New publications from the Mangyan Heritage Center (MHC) www.mangyan.org started to include the updated character earlier this year, starting with the Surat Mangyan Primer. I'll update the individual .zip files in each of the font's DeviantArt download hosting later since I still need to update the keyboarding charts for them. The Postma dash — RA and its vowel modifiers (kudlit) are still included in the fonts. Accessed by typing the Uppercase R, 7, and 8 keys. The new RA and its kudlit are now currently set to the lowercase r, (, and ) keys. A custom keyboard layout for Mangyan script is in the works for Windows 8 and Mac OSX. 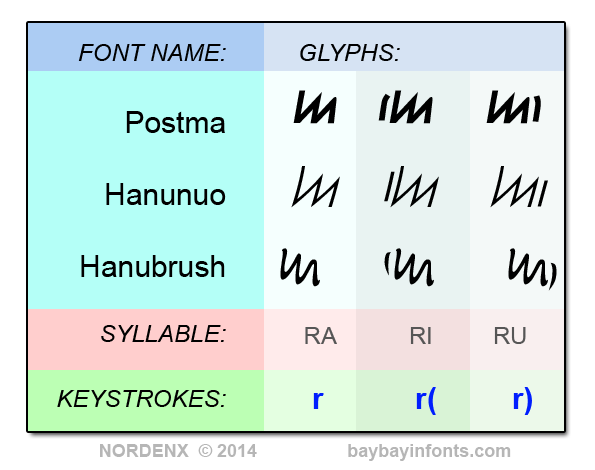 I just need to optimize the Hanunuo Unicode font and finish up a Buhid font/typeface that will share some of its Unicode range with Hanunuo for similar kudlit positions. The keyboard layout will probably be ready before the end of this year. I'm also working on a Surat Mangyan children's coloring book for the MHC. 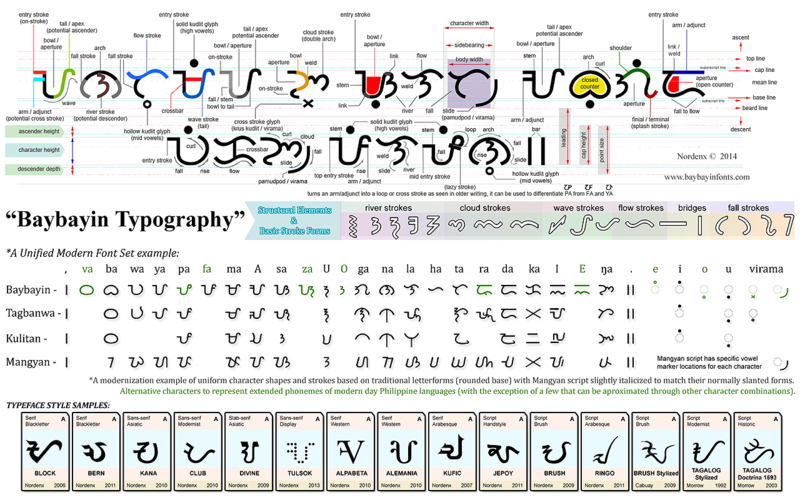 Updated Chart for the Mangyan Postma Font. We are losing our pioneers. Last year, Bayani Mendoza de Leon passed away (Nov. 24, 1942 - Sept. 13, 2013). Recently, Hector Santos passed away (Sept. 15, 1941 - July 30, 2014). I received the news from another baybayin font pioneer, Paul Morrow. When I started researching about Philippine culture & history back in the mid 90's, there wasn't much about baybayin & surat Mangyan online until Hector Santos' & Paul Morrow's sites came along. They were one of the first to publish reliable information about baybayin online. 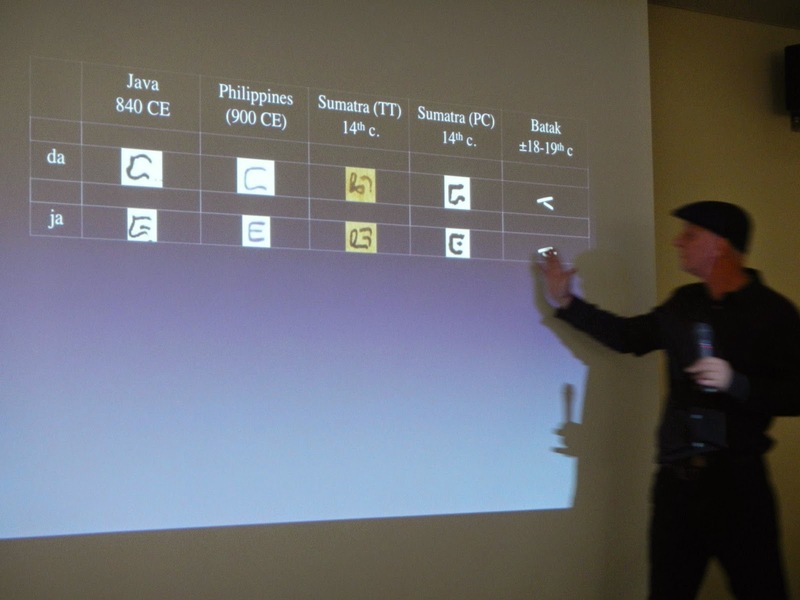 Hector Santos was the first to offer commercial digitized baybayin fonts online. Paul Morrow followed suit and was the first to offer free fonts from historic typefaces and the first modern stylized and uniformed typeface. Bayani Mendoza de Leon's manual introduced me to current modernization attempts. Their collective work inspired me to be more pro-active with my research. Five years later, after catching up with all the foreign language materials borrowed from library archives from all over, I began sharing what I've learned and fonts/typefaces I created to the world. Without Paul & Hector's work, surely my baybayin knowledge & fonts would've been poorer. I regret not being able to meet the Hector Santos and Bayani Mendoza de Leon in person to thank them. Their legacy will live on through every baybayin font that will ever come along. Several of my typeface designs has become so popular over the years that people tend to forget to give me credit for the fonts and neglect my copyright restrictions about commercial use. My commercial licensing prices are quite reasonable. And, if you're operating a non-profit or a student/school or just a small group of enthusiast/activists, you'll find me very agreeable and happy to oblige with giving you and your group permission to use any of my font for a short-run low-volume distribution (or even sales). I do appreciate the mention even in small print, but if you ask kindly, you don't even have to credit me or provide a link back to this blog or my site ( baybayinfonts.com ). As it stands, I have sold four commercial licenses for my fonts; two for branding, one for specific font sets, and one major license for full use of every typeface I release publicly and privately. I take my role as a licensor seriously and will protect the interests of my licensees. This is why when one points out certain issues, I respond quickly. I guess some folks either ignores or don't read my copyright terms or they just plainly lack ethics. This is not the first time this happened. A couple of years ago, a popular and respectable Philippine Culture store carried shirts & tote bags that used my fonts prominently in their designs. I'm very happy that the store immediately responded to my email about the matter and promptly dropped the products from the company/designer who sold them the items. Even Kristian Kabuay of Baybayin.com has to battle the big company "Walker Underwear Philippines" for theft of his personal font. Bottom line: I wish that people respect and value artists' & designers' work and give them the credit (or financial compensation) that they deserve. For the most part, I wish that the general public would learn how to use the fonts properly and learn how to read & write Baybayin correctly and more proficiently. UPDATE: [Aug. 20, 2013] After a short disappearance from the Google Play store, the app is back up again. Updated photos suggests that some updates where made. A limited dictionary using Paul Morrow's Tagalog Stylized font shows that the app's author/s seem to know how to properly write in classical & traditional baybayin, even transliterating borrowed Spanish words correctly. Yet, the "translator" part of the app still uses my Baybayin Mono font and can not transliterate properly, it can't even "transliterate" simple words and names that it deems "foreign". *sigh... I sent another legal report of the copyright violation to Google Play. [Aug. 6, 2013] After a stern email & report to Google Play, the offending app has been removed from the Google Play store. Since I did not get any response from either company, I'm not sure which one pulled the plug. Noto Bad, Noto Good. Just okay. As they are right now, when I tested the font (Noto Sans), the Philippine scripts are still mostly useless; a big chunk of the Surat Mangyan scripts are not mapped (incorrect character shapes plus Unicode still does not have the range for the various proper kudlit markers) and the updated RA are not included. The kudlits and virama still doesn't stack or render correctly, the baybayin characters are a mix of styles and not uniform, the whole collection does not really visually "harmonize" well. And unless you specifically chose Noto Sans as your default browser or mobile font, it still won't show or show properly (in other non Google/Chrome browsers). Also, you still need a custom keyboard layout to type Baybayin. The project team are still ironing out some issues with the other language's scripts. I'll wait and see how they resolve those issues as well. It's still a little early to tell if the Noto project will be helpful to Baybayin scripts or not. Kulitan is still not included in Unicode. And Noto got most of its language data & sample texts are from the Unicode CLDR project. 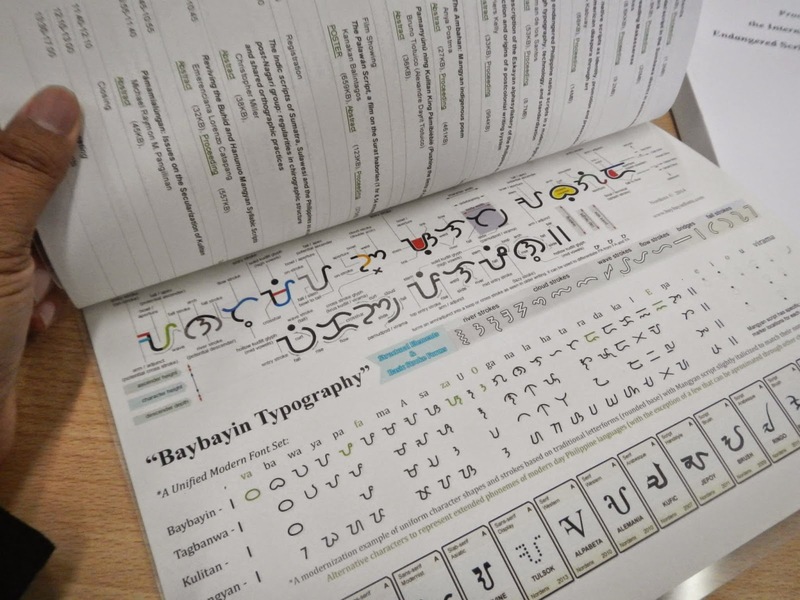 Saving Baybayin through Technology, Typography, and Standardization. I was in attendance at the International Workshop on Endangered Scripts of Island Southeast Asia last month (Feb. 27 - Mar. 1) in Tokyo, Japan. Hosted by Linguistic Dynamics Science Project (LingDy), a strategic project of the Research Institute for Languages and Cultures of Asia and Africa (ILCAA), at the Tokyo University of Foreign Studies (TUFS). 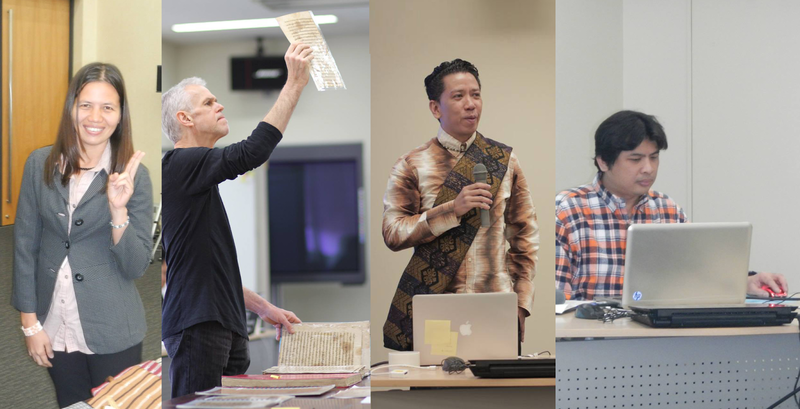 The workshop discussed the writing systems and traditions of Southeast Asia, focused on (but was not limited to) the endangered Indic scripts of the Philippines, Sumatra and Sulawesi. We presented our papers which covered topics regarding historical and structural relationships, literature, documentation, revival, modern functions, adaptations and social/cultural meaning. In addition to the academic component of the workshop, the organizers encouraged participation by culture-bearers, activists, and artists - this is how we got included. From left to right: Mr. Christian Cabuay (a.k.a. Kristian Kabuay, Baybayin Artist, Calligrapher, Entrepreneur), Mrs. Emily Lorenzo Catapang (Executive Director of the Mangyan Heritage Center), ME: Norman de los Santos (a.k.a. Nordenx, Baybayin Typographer, Graphic Designer), and the young Mr. Bruno Tiotuico (Sulat Kapampangan activist, Photographer). My well-received handout on Baybayin Typography and Standardization. My paper and abstract are available at the LyngDy page linked above. Note: You can download and print a copy of the handout image above for your own personal use. However, please don't publish or distribute this image commercially without prior consent or licensing from the author. The workshop answered a lot of questions regarding the history & relationships of SEA scripts and Philippine scripts. It opened up a lot of ideas and it offered up a lot of insight and exchange between academic and non-academic culture bearers. Expect that my experience and what we've learned in Tokyo will work its way into my font development.